You will select one of these projects the day of the workshop. Cost varies from $80 to $125, see prices given below. Please note some premium mosaicing materials may incur an additional charge. Feeling "creatively challenged"? Then this workshop is for you! 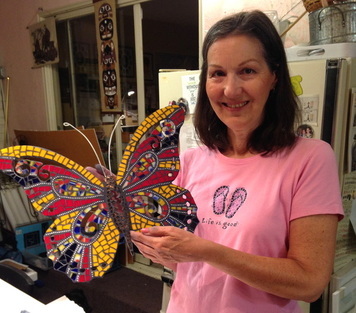 You will create a "mosaic quilt" using materials such as broken ceramics, stained glass, stones, beach glass and more to create a one-of-a-kind mosaic piece. 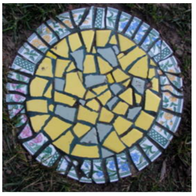 Creating mosaic garden markers Perfect for planting in your garden or garden pot. If you haven't had the chance to make one for your garden, then this is the perfect workshop for you! 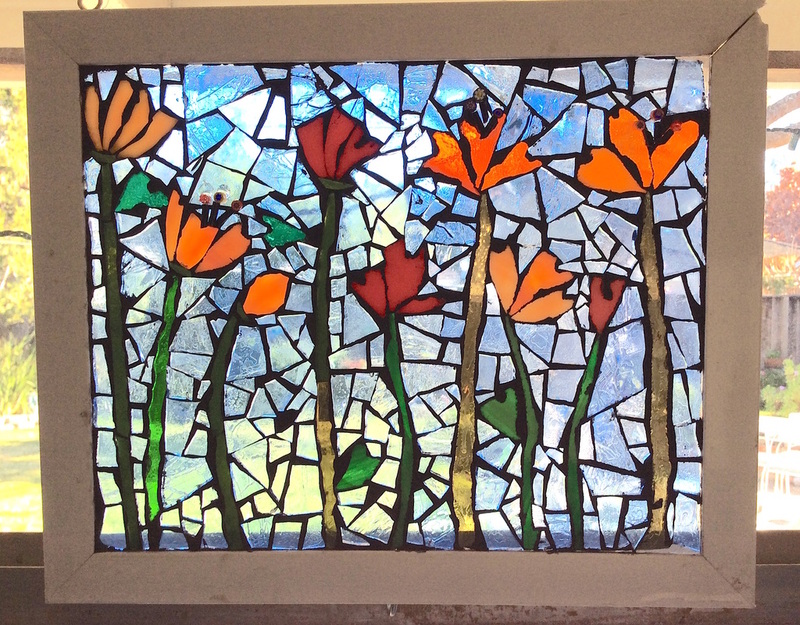 You will create a mosaic art piece & attach it to an iron stake. Creating a mosaic mirror is a popular workshop at The Mosaic Gardens. These mirrors look beautiful hung on the wall or placed on a display easel. You will create a unique bottle piece by mosaicking around the bottle with materials of your choice. 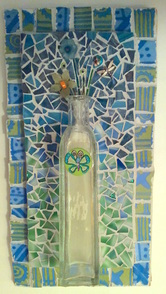 Your mosaic will look lovely hung on the wall or placed on a display easel. 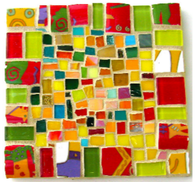 Create a stunning, functional mosaic art piece that you will enjoy using on your dining table. You will create a spectacular mosaic bouquet blooming out of a "vase" of your choice. The bouquets look beautiful hung on the wall or placed on a display easel. You can buy mosaic stepping stones at many stores, but why buy something that everyone else has, when you can learn how to create your own? At this workshop you will choose from either a round 12" diameter or 12" square surface to create a one-of-a-kind stepping stone for your garden. Create a delightful functional side table that you will enjoy inside or out! 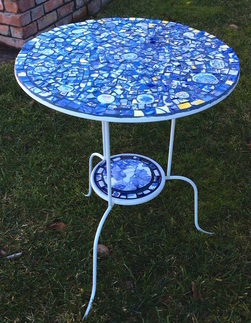 Metal table, mosaicing supplies, and Nancy's instruction & guidance provided. You choose the grout color, and leave your project for Nancy to grout (additional charge, depends on size). An Advanced Mosaic Project requires attending a beginning Mosaic Workshop at The Mosaic Gardens to get started. To complete any project like this, you will need to schedule several Wednesday evening or weekend Open Studio sessions. Cost for these projects are based on time and materials ($10/hour plus materials).